The Alexanderwerk PP 150 C is especially designed to meet the highest requirements and standards for the chemical industry. 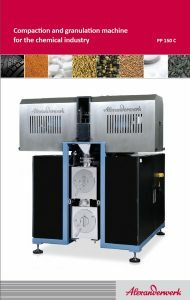 As the smallest Alexanderwerk model for the chemical sector, it provides a roller diameter of 150 mm and a width of 75 mm. With a throughput up to 400 kg/h, the PP 150 C can be used in a test center, for R&D, as well as in production operations. The double sided bearing design of the rollers offers a maximum pressure force of 30kN/cm. Moreover, previously determined process parameters can easily be scaled up to larger production machines of the Alexanderwerk PP and WP machine series. Due to its modular design, great flexibility as well as adaptability to different granule sizes can be achieved. The basic machine, consisting of a feed system and compaction rollers, can be provided either without a crushing system. To ensure a compact design, all control systems (including hydraulics, vacuum pump, cooling water and air distribution system) are integrated into the machine.